Process Oriented. Thursday’s Line Up. The Process Room has blossomed into one of the conference’s most popular offerings, way beyond the glimmer it was in former Program Director, Steve Hilton’s eyes three years ago. As those who attended NCECA in Providence know, the room was packed and we created an overflow room with live video feed. For those who couldn’t squeeze into either place, Our YouTube Channel offers highlights from the Jennifer Allen session and the Robert Lawarre session. The remaining 12 sessions have been professionally edited into 3 compilations, each featuring four artists. These should be available for purchase as a digital download later this week! This year, the conference center is larger and boasts space for all to soak in the techniques and tricks our presenters are so generously sharing. Artists begin at the top of each hour, offering a condensed 30-minute presentation on their specialty. We then move from the quiet forms of yoppolo to the riotous and complex surfaces of Jessica Putnam-Phillips, “Using Laser & Commercial Decals with China Paint and Lusters.” Jessica will teach you how to make laser printer decals with common office machines and how to combine these with commercial water-slide decals, lusters and china paints. Along the way she will discuss successful application techniques and the importance of their order, proper brushes, firing schedules and safety concerns. Besides the technical components, she will share her “decal collage” process and discuss how careful planning will bring balance to the composition. 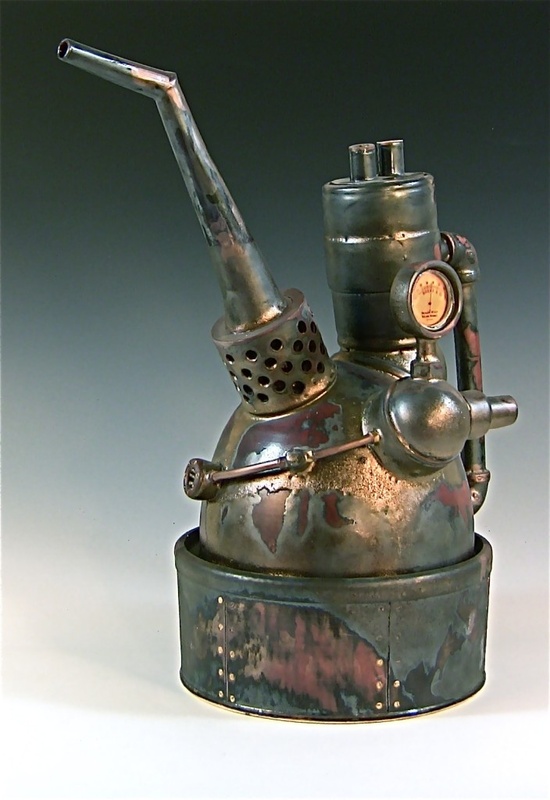 Moving to a more industrial mode will be Tim See, and his techniques for constructing ceramic oilcan. He will talk about his creative process, where the inspiration came from for them as well as planning out all the components into a cohesive whole. Tim will trouble shoot the attachment of multiple parts, show how minor adjustments can have a big impact on the attitude of the piece and mimicking a rusty, metallic surface. Jumping from machine to human form is Kyungmin Park’s “Expressive Facial Features” presentation on non-verbal communication through emotive sculpting. Touching on the importance of contemporary and historical figurative works and then bringing that knowledge into the studio. Kyungmin will cover how to form the basic head shape, sculpting an opened mouth with teeth and tongue and move onto forming the eyes and eyebrows. The demonstration will show the impact of different facial expressions altering the theme of the work and how exaggerated facial features can carry stronger messages. 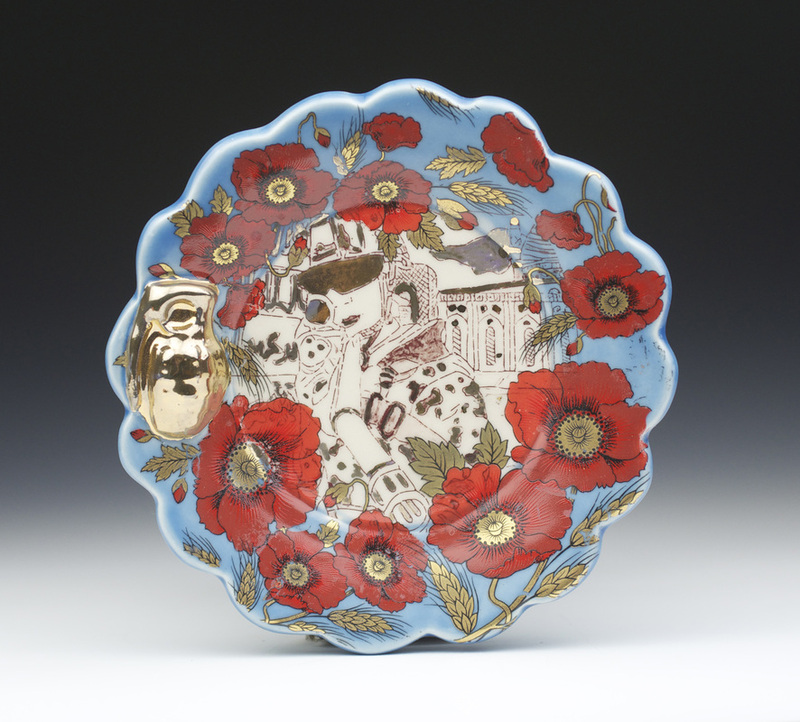 Meticulous hand-carved porcelain by Yoshi Fujii will be demonstrated from start to finish. Designs on leatherhard wares are plotted out, sketched in pencil and carved with small loop tools. These edges are then refined with a sponge and additional touches, carved or slip-trailed are added. The result is a surface of valleys and hills for the glaze to pool or break providing an incredible amount of depth in a shallow surface. 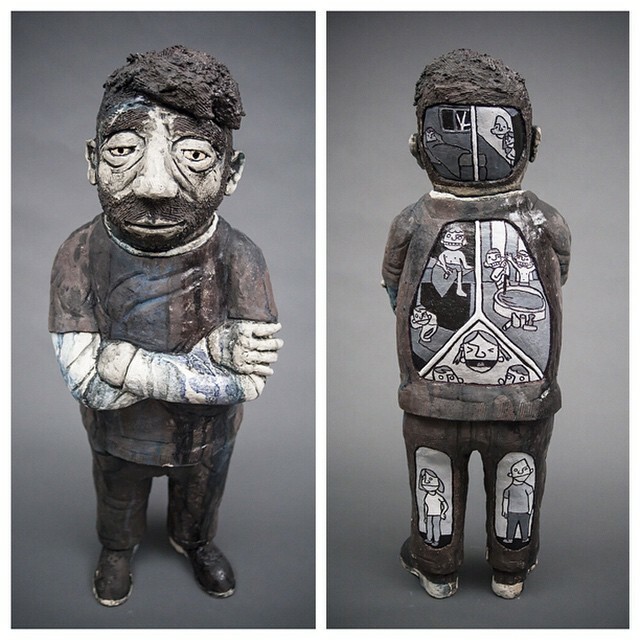 Jeff Campana will show his signature technique of thrown, sliced and reassembled wares. 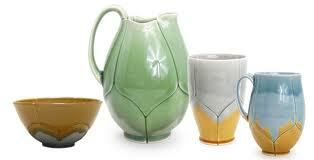 The seams of each section are left as part of the design for the glaze to flow and accentuate. He will help avoid structural failings that can occur with such a challenging building method through his experience and almost scientific approach to making. Brett Marshall Tucker will help you activate your surfaces with some “Graphic Relief” in the form of sgraffito combined with strong design. A clean aesthetic of black slip on white porcelain will assist to illustrate the process. 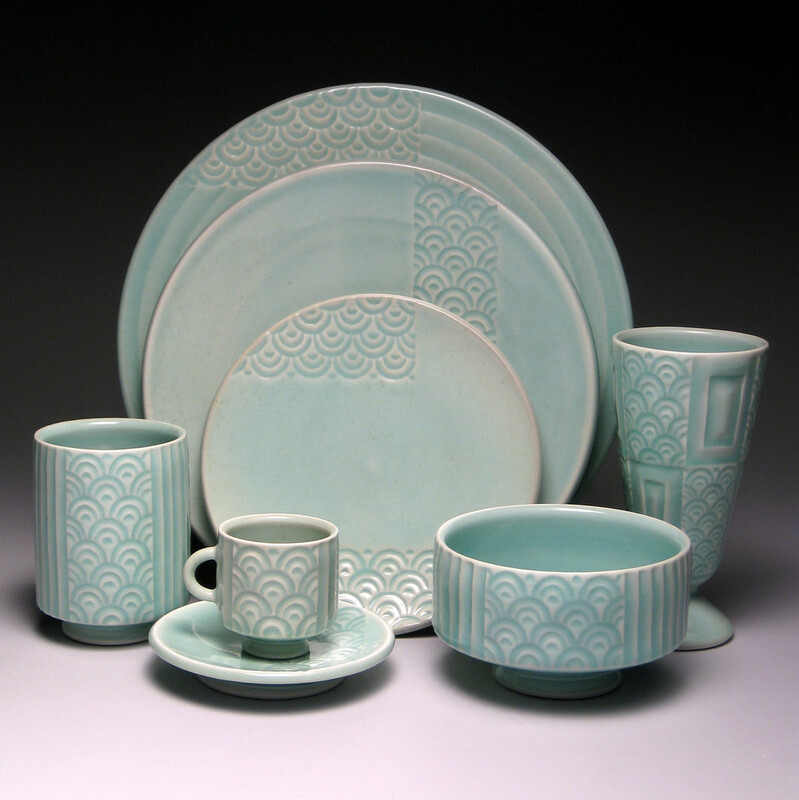 Sgraffito is painting the clay with a contrasting color of slip or underglaze and then scratching back through to reveal the clay beneath, creating your design. His demonstration is for all levels: the doodlers and carvers in the crowd as well as for those who are unfamiliar with the term or uncomfortable with drawing, he will help you to translate an image onto the surface. When you approach the clay as a canvas it can open up all sorts of possible forms and possibilities. 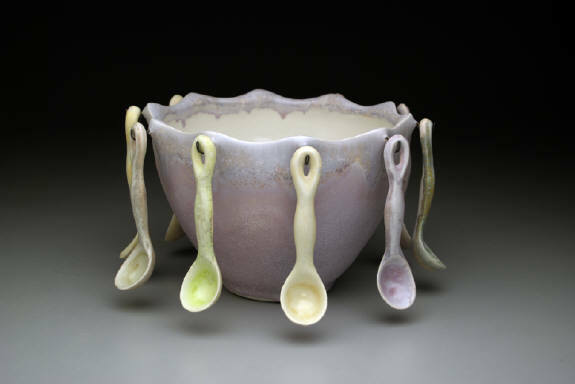 Lori Watts, will close out the first day with her thrown, stretched and assembled oval butter dishes. Using the wheel as the start, she will then toss the forms to elongated and alter into a tray, an open cylinder and slumped lid. Altering, attaching, finishing and embellishing steps will be covered resulting in the exalted butter dish. Mmmm, butter.